A nice article by John Seely Brown and Richard P. Adler in EDUCAUSE. Well worth a reading! In the twentieth century, the dominant approach to education focused on helping students to build stocks of knowledge and cognitive skills that could be deployed later in appropriate situations. This approach to education worked well in a relatively stable, slowly changing world in which careers typically lasted a lifetime. But the twenty-first century is quite different. The world is evolving at an increasing pace. When jobs change, as they are likely to do, we can no longer expect to send someone back to school to be retrained. By the time that happens, the domain of inquiry is likely to have morphed yet again. PROLEARN, the Network of Excellence in Technology Enhanced Learning for Professionals, now working under the umbrella of the EATEL Association (http://www.ea-tel.eu/) and PALETTE, European Integrated Project aiming at developing interoperable web-services for Communities of Practice (http://palette.ercim.org) are pleased to announce their joint 2008 Summer School. Our ambition is to foster cross-domain training and collaboration opportunities among researchers in Europe and beyond, working in the disparate fields of expertise which promote the advancement of TEL at the workplace. The programme includes lectures and working sessions from leading professors in the field, tutoring, mentoring, and joint research opportunities. Additionally the school will offer practical sessions in research methodology for Technology Enhanced Learning. Advanced PhD students will be identified to present their research at the Third European Conference on Technology Enhanced Learning in Maastricht, The Netherlands, September 17-19, 2008 (http://www.ectel08.org), and to participate in EATEL thematic workshops. In order to increase social contacts among the summer school participants, the programme will include several social events. A variety of sport activities will also be offered to the summer school participants. Cultural excursions are organised on the Sunday preceding the summer school and the Saturday which closes the summer school. This year the PROLEARN/EATEL - PALETTE joint Summer School will benefit from a special grant from SEEERA.NET to promote collaboration with the Western Balkan countries. The summer school has the pro-active support from a growing number of EU IST and eContent funded R&D projects such as APOSDLE, MATURE, iCAMP, PROLIX, MACE, TENCompetence, GRAPPLE, and ARIADNE. Magnificent and exciting, mysterious and surprising, Ohrid is one of the most ancient towns in Europe, flavoured with a taste of centuries gone by, full of Hellenistic, Roman, Slavic, Byzantine, and Turkish memories. During the classical and medieval periods Orhid was the artistic, cultural and spiritual centre of the Balkans and has been called a notable bridge of European art. The town is proud of its rich cultural heritage and unique lake which both belong to UNESCO's World Cultural and Natural Heritage (http://www.ohrid.com.mk). Accommodation and summer school facilities will be made available at Hotel Granit (http://www.hotelgranit.com.mk). Granit Hotel is located on the coast of Lake Ohrid in St. Stefan, 5 km from the centre of Ohrid. It is 12 km from the Ohrid airport. The Hotel has two harbours which enable access to the hotel and the beach from the lake. The wonderful woods which surround St. Stefan Monastery are located 1 km from the Granit Hotel. PhD students are asked to share a double room with other PhD students. The cost for PhD students is Euro 500 (including accommodation - 7 nights in double room, meals, and excursions). PROLEARN - PALETTE Summer School 2008 will offer 50 scholarships to PhD students to cover summer school accommodation, catering, and events. Please indicate if you are applying for a scholarship in your application. The summer school is intended for PhD students investigating issues related to Technology Enhanced Learning and making progress on their dissertation research. PhD students are invited to submit applications to mailto:summerschool@i5.informatik.rwth-aachen.de. The application should include a Curriculum Vitae and a summary (not to exceed 5 pages including references and any figures, tables, etc.) describing the student's dissertation. The deadline for submissions is March 15th, 2008. To ensure a high ratio between tutors and students the school will be limited to 60 PhD students. We look forward to seeing you at the summer school! 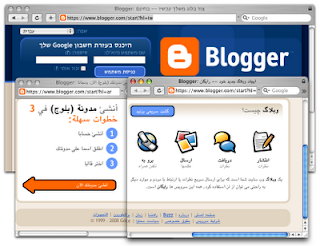 Blogger is translated into — Arabic, Persian, and Hebrew are written from right to left. As you can see from the above screenshot, we had to flip the whole interface around. Supporting these languages is a huge milestone for us because — unlike the other 37 languages Besides localizing the Blogger interface into these three languages, we have right-to-left templates and have added new toolbar buttons for bi-directional text editing in the post editor. Slidecast is a service developed by Slideshare. As Slideshare puts it "Slidecasting is a new multimedia format for viewing slide decks synchronized with an audio file". Slideshare also provides instructions and a demo on how to create a slidecast. Upload your presentation file to SlideShare. Yahoo announced its support of the OpenID 2.0 standard. Big Web players like Google and AOL have already begun supporting this open identification standard and Yahoo is the next on the list. I believe that OpenID will have a great future. It's just a matter of time that Google will offer a full support of OpenID. To note that Brad Fitzpatrick, the founder of LiveJournal and creator of OpenID joined Google last year to support the OpenSocial developer initiative. More OpenID links are available here. In this post, Erick Schonfeld has compiled a nice list of the most telling headlines from TechCrunch posts in 2007, divided by month. Many headlines in this list are related to Google activities and initiatives (e.g. OpenSocial and Android). Was 2007 the year of Google? Viacom Drops a $1 Billion Nuke on Google.